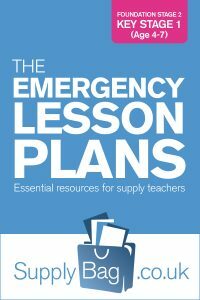 These emergency lesson plans for Reception Class Literacy are only to be used by supply teachers who are faced with no planning or easily accessible resources. Recap on sounds already learnt. Ask students to tell you sounds they know. Write, or use students name labels, and ask them to identify their own name. Act out a nursery rhyme. Practice writing CVC words through sounding them out. Write names with and without capital letters and ask which is right. Read a sentence and miss a word out. Ask the group if it makes sense and why. Discuss where they may find words. Write a group sentence about a topic. Write a menu/shopping list/letter as a group checking it makes sense. Discuss features of a book e.g. title, front cover, back cover, blurb.